Russian folk death metallers Last Wail from Omsk of southwestern Siberia have recently released their second work. Last Wail were formed in 2008 with the intention to combine melodic extreme metal with folk metal. They signed to Stygian Crypt Productions and their debut full-length album “The Tale of Endless Night” was out in 2011. Two years later, in the summer of 2013, they returned with their sophomore full-length album “Memories” released again by their label Stygian Crypt! From the first moments of this album, the huge improvement of the band is more than obvious. Their sound is much heavier and more solid and the production clearer and powerful. 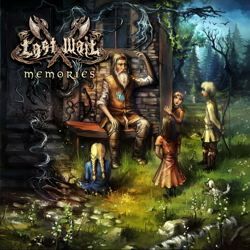 Last Wail play epic melodic death black metal and their guitars are influenced by folk tunes and scales. They use synths and some traditional instruments, like acoustic guitars, flutes, whistles and bagpipes, but the metal orchestrations are more dominant in their sound. Except for flutes that sometimes have a leading role in melodies, all other folk instruments stay mostly in the background, helping the band to enrich its sound. The majority of their compositions moves in fast tempo and their songs have an epic majestic fantasy atmosphere; there are also a few quieter acoustic parts with nice flutes. Alina “Alien” Eliseeva’s vocals remain exclusively on the brutal side, somewhere between black metal screams and death metal growls. If you don’t know it, you can’t even suspect that their singer is female! Her vocals are epic and aggressive, adding the needed heaviness to their music. They use English lyrics, transferring the listener to a world battles and magic, with stories about fantasy creatures mostly from the Middle Ages. “Memories” is a very good album for fans of melodic death metal with folk and epic touches. Last Wail are improved a lot in my opinion, but I still expect to listen to something more personal and original from them in the future, since this genre is overloaded by many great bands and is almost exhausted. Nevertheless it is a very decent and enjoyable album with great sound. “Memories” is released by Stygian Crypt Productions in standard jewel case edition with 16-page booklet, including all lyrics. Cover artwork is painted by Igor Artemenko and layout is designed by W. Smerdulak. You can visit their official pages below for sound samples. what an awesome cover !! !